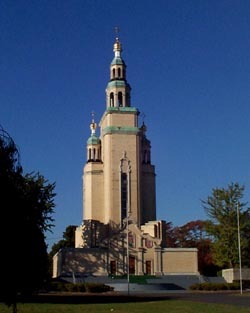 Dominating the property of the Metropolia of the UOC of USA in Somerset/South Bound Brook, NJ is the unique edifice of St. Andrew Memorial Church. Soaring skyward, the church is a monument to the Ukrainian Cossak Baroque architecture. 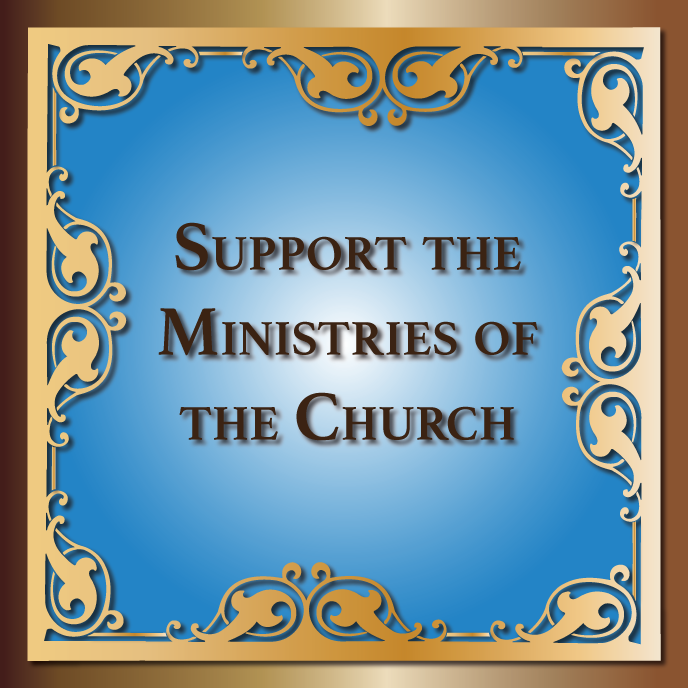 A result of years of planning and the sacrifices, labors and donations of countless faithful, the church is dedicated to all who perished in the Stalinist famine (Holodomor) of 1932-33 and who have given their lives for the cause of freedom and justice. In 1955, construction began on St. Andrew Memorial Church which continued for ten years and the Memorial Church was consecrated on October 10, 1965. 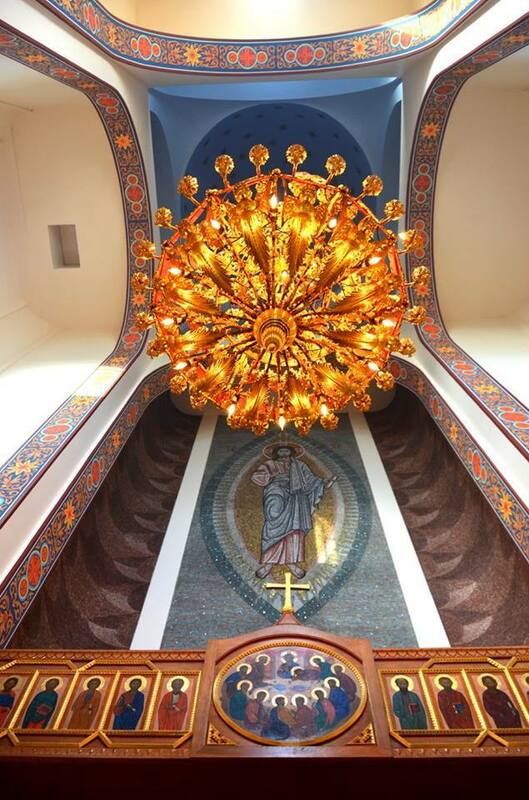 The interior of the church reflects the mystery, beauty and splendor of Eastern Orthodox Christian spirituality. The Iconostasis (Icon Screen) which separates the Holy of Holiest from the nave of the church is the work of the Ukrainian artist Petro Cholodny. In 1980, and again in 1996, the interior was decorated by Ukrainian artist, Boris Makarenko. We can add that the Memorial Church, more than anything else, has become the symbol of our Ukrainian Orthodox Church of the USA and our Metropolia Center – the Ukrainian Jerusalem, as Patriarch Mstyslav of Blessed Memory so fondly called it. 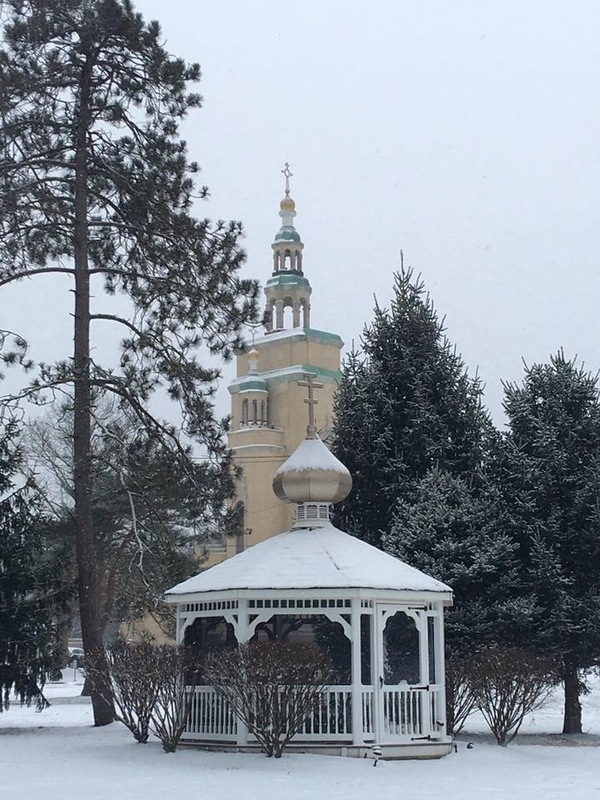 Holy Transfiguration Chapel, situated between St. Andrew Memorial Church and the historic Fisher House, provides a peaceful and spritiual retreat for prayer and reflection. The Chapel is a part of the Apostolic Prayer Trail located on the property of the Metropolia. The Prayer Trail consists of 15 icons placed on wooden crosses along the path between the Memorial Church and the Cemetery. The icons comprised the Twelve Apostles, St. Paul, the Equal to the Apostles the Holy Prince St. Volodymyr the Great and the Blessed Saint Princess Olha and the finally the Icon of the Transfiguration in the Chapel. The Holy Transfiguration Chapel and Prayer Trail were blessed on September 28, 2002 on the 50th Anniversary Celebration of purchase of the Metropolia Property. The Holy Resurrection Mausoleum was designed by then Archbishop Mstyslav and architect Yurij Kodak-Vasylchenko to be a final resting place for active members of Christ’s Church as leaders of the Ukrainian community. In 1965, the Mausoleum “temporarily” became the home of the Ukrainian Orthodox Church Museum for 35 years. The Museum collection has since been relocated and waiting a final home in the under-construction Ukrainian History and Education Center on the Metropolia grounds. After the transfer of the Museum, the completion of the mausoleum could take place. Construction began in December 2000 and the Holy Resurrection Mausoleum was officially opened and dedicate on St. Thomas Sunday, 22 April 2001 by His Beatitude Metropolitan Constantine and Archbishops Antony and Vsevelod. The crypt of His Holiness Patriarch Mstyslav I, the first Patriarch of Kyiv and all-Ukraine of the Ukrainian Autocephalous Orthodox Church, is located at the center of the Mausoleum beneath the altar and Chapel he was largely responsible for building. 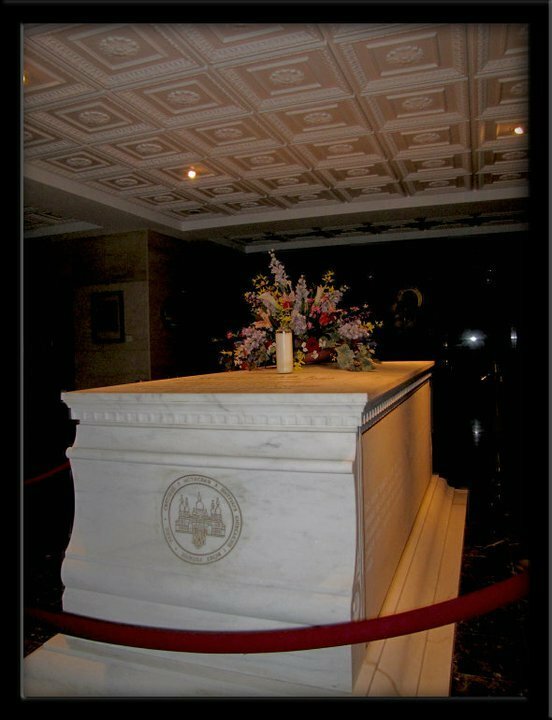 The crypt was blessed on June 11, 1994, one year after his repose. There is a small exhibit of his life in the rooms around the crypt. The available crypts of the mausoleum gracefully surround the Patriarch’s crypt. Those who choose to be interred here will rest in a serene setting where their family and friends may visit in an atmosphere conducive to spiritual reflection and remembrance. For an appointment to view the mausoleum or discuss the possibility of crypt purchases, contact the Cemetery office at 732-356-0090. The cemetery staff is always prepared to provide you with all the information you will need to make your own positive decisions about your final earthly resting place. On October 23, 1983 the impressive monument to Metropolitan Vasyl Lypkivskyj was erected and blessed. The monument was designed and created by artist Petro Kapschutschenko. Metropolitan Vasyl is a martyr for our Holy Ukrainian Orthodox Church and without the courage he displayed, it is most likely that our church here in the USA would not be in existence today. He awakened the consciousness of the faithful about their Ukrainian Orthodox Faith and the spiritual legacy handed down to them by their forefathers – the saints and martyrs who gave their life’s blood in protection of that legacy. Year 1987 marked the beginning of a Holy Year of Commemoration in anticipation of the 1,000th anniversary of the Baptism of Ukraine into the Holy Faith. On August 16th of that year the blessing of the monument dedicated to St. Olha took place. The St. Olha Monument was designed and created by artist Petro Kapschutschenko. This was the initiative of the United Ukrainian Orthodox Sisterhoods and Ukrainian women throughout the Diaspora. 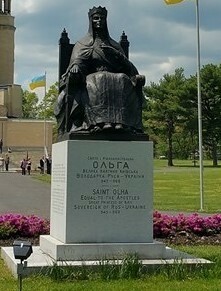 It is meant to commemorate St. Olha as “Equal to the Apostles”, a figure who was instrumental in bringing Christianity to the Ukrainian nation. This memorial-monument was established by the United Ukrainan Orthodox Sisterhoods in 2004. It is dedicated to the women and children victims of the man-made Famine (Holodomor) of 1932-1933 in Ukraine. The Ukrainian-American Veterans National Monument was constructed by the Ukrainian American Veterans, Inc. UAV is a patriotic, educational, civic and social organization founded in 1948. It was designed by Ukrainian Canadian sculptor John Jaciw. The design has an uplifting effect upon observers. Two tall granite pillars immediately lift the eyes, hearts, and minds of any visitor in body and spirit to prayerful commemoration of those Ukrainian Americans who gave so much to and for their nation and all it stands for. This effect dramatically increases as one draws physically closer to the monument. The monument was erected to not only honor both present and past members of the UAV, but to remember and recognize all veterans of Ukrainian descent who served in the Armed Forces of the United States of America. The monument was dedicated on October 3, 2015. 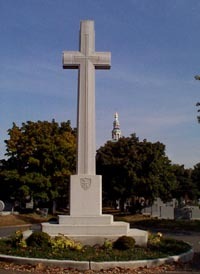 Located at the center of the St. Andrew Cemetery, behind St. Andrew Memorial Church, this ten-meter high Cross stands in memory of the figters for freedom of Ukraine. The cross was designed by artist Petro Cholodny, Jr.
On the cross you will find carved the state coat of arms of Ukraine and the insignia of the Ukrainian army. At the foot of the cross, lays the original plate from the grave of Chief Otaman Symon Petliura, which was brought from Paris to South Bound Brook in 1970. The Sisterhood of our Metropolia Center was established over 50 years ago and is blessed with an active and dedicated group of women, organized as the Sisterhood of Protection of the Mother of God. Since the founding of Memorial Church the women have been an integral part of the growth and development of the community. Whether through their fund-raising activities, or their help in church, our sisterhood members have made an incalculable contribution to our parish. Their main fund-raising activity consists of Ukrainian food sales, which are held on the St. Thomas Sunday weekend. They also cater functions at the church hall (Tryzna), sponsor parish meals and luncheons, decorate the hall and church, and help in other ways. As they are under the patronage of the Protection of the Mother of God, a feast day (October 1/14) very dear to the Ukrainian people, the parish honors our sisterhood members at a luncheon held on the Sunday nearest to the feast day of the Holy Protection. For more information about the Sisterhood, or to join, contact: Dobrodiyka Lesia Siwko, President (732) 742-0140. 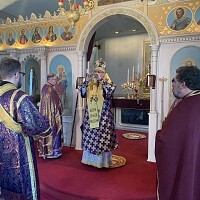 Those who visit the church on Sundays or feast days have the opportunity of witnessing the worship of the Ukrainian Orthodox church in all its splendor. 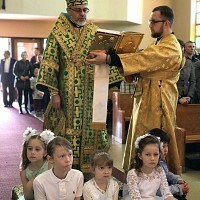 The Church’s choir, under the direction of Dr. Michael Andrec, through its use of ancient Kyivan liturgical melodies and compositions of renowned composers, presents the fullness of Ukrainian Orthodox spirituality in word and note.